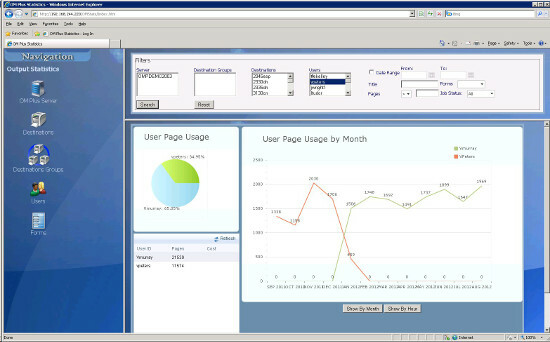 OM Plus Stats Manager (SM) is a software application that enables organizations to analyse and understand the who, what, when, where of printing, MFD copying, faxing, and scanning in their enterprise. OM Plus SM collects data from OM Plus Delivery Manager, OM Plus Fleet Manager and other sources to provide a comprehensive view of device usage. In addition to traditional print and copy counts by device OM Plus SM is able to provide print counts by “user”. This user based metric allows organisations to understand who is printing, what they are printing, when they are printing it, what application the docs are coming from, and even the titles of the documents. The data is stored in a standard database and the user can create customisable views through easy to use filters. With this information, organisations can collect usage information, collect data that can be used for charging back costs to users/departments, develop/enforce print policies, track asset utilisation, verify timeliness of output, and track error conditions. By understanding print usage, needs, and problems, organisations can properly allocate equipment, set policies and right size its support staff.